Dennis Kucinich, from left, Bill O'Neill, moderator WTOL-TV anchor Jerry Anderson, Joe Schiavoni and Richard Cordray take part in the Ohio Governor Democrat debate Wednesday night in Toledo. For more than an hour, the candidates were asked about marijuana, diversity on their teams, gun laws, infant mortality, opioids and algae blooms in Lake Erie. 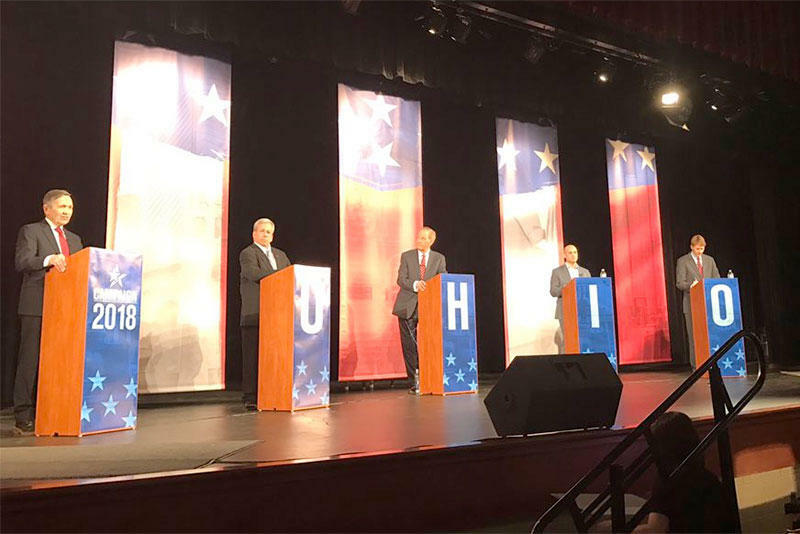 It was the fourth debate for state senator Joe Schiavoni, who was the first Democrat in the race and remained after three other women candidates dropped out. But he is still the least known candidate of the group. "Name recognition on a poll means nothing to me," Schiavoni said. "Going to places and talking to people about what's important to them means everything to me." The three other candidates who dropped out all threw their support behind Richard Cordray, the former Ohio attorney general and head of the federal Consumer Financial Protection Bureau. He said he's happy to have also gotten some key union support before the primary. "I'm proud to have their support, and I'm proud to have earned their support," Cordray said. "And what I can say is, I'm not anointed by anyone. I will earn support as we move forward in this primary, and I'm happy to have it go on that basis." Cordray referenced several comments made by former Ohio Supreme Court Justice William O'Neill, who called Cordray "Prince Richard" several times, and launched at least two attacks that included mentions that Cordray had received the endorsement of the NRA when he ran for re-election as attorney general in 2010. "The only two people on this stage that have won statewide is Richard Cordray and myself," O'Neill said. "The difference being, I won in '12. He lost to Mike DeWine with the backing of the NRA in '10." Cordray shot back a few times at O'Neill, including calling a Facebook post in which O'Neill discussed his sexual past disgusting and inexcusable. Cordray may have been expecting an assault from former Cleveland mayor and Congressman Dennis Kucinich, since Kucinich had blasted Cordray in a speech at the City Club of Cleveland last month. But Kucinich didn't take that tactic this time - but did have to defend himself for repeatedly meeting with Syrian President Bashar al Assad. "Yes, I've met with many people who might be found objectionable. But I've always done that following the Polish style of creating peace," Kucinich said. On the topic of working with Republican opponents, Schiavoni said he was no stranger to that. "This is my life. I mean, I've been the minority leader in the Statehouse. I've been down there nine years working in the minority," he said. "Every time I drive my car from Youngstown down to Columbus, I'm thinking about how we can get things done for the people." Cordray brought up the two people that one of the four Democrats will face this fall when the topic of Medicaid expansion came up, saying that the legislature will likely dismantle it. "And Mary Taylor is behind them to take it away from Ohioans. And Mike DeWine is tongue tied on that issue," Cordray said. "He will not say that he will support the Medicaid expansion because he's afraid of his right wing in the primary." When it comes to campaigning, the candidates were asked if they'd welcome former presidential candidate Hillary Clinton to help out. Kucinich was enthusiastic. "I would say to Hillary Clinton, who I've known for many years, come on down," Kucinich said. "I'd say to all Democrats, come on to Ohio, because if I'm the nominee we're going to take back Ohio." And that question of how to unify the party the four candidates all hope to represent did come up. O'Neill, who has been sharply critical of the Ohio Democratic Party in the past, didn't spare it this time when asked about a memo that said the party is concerned about the viability of his candidacy because of - quote - financial and ethical challenges. "The leadership of the Ohio Democratic Party does not like me and I welcome their dislike," O'Neill said. But O'Neill and the other candidates said they would support whoever the party's nominee turns out to be.